Early in the outdoor climbing season, I woke up and my finger was swollen. It hurt to the touch. Horrified, I started googling: finger tendon injuries, pulley tendon injuries, flexor tendon injuries. I found a lot out there, but the articles and forum posts did not help me. In some ways, they have made it worse. I eventually saw a physiotherapist and my finger is finally healing. Unfortunately, it took me longer than necessary to get here. This is why I am writing this post. My hope is that a climber who is also googling will find this post and it will help, even just a little bit. The minute you think something might be wrong with your hand, even a little bit, stop climbing. I know that every online article tells you this and you are probably not going to listen. I did not. But the best thing you could do for yourself is to stop climbing for today. Cancel your climbing plans for the next two months. And then stop climbing until you are fully healed, which is NOT when it stops hurting. (See #2). Every minute you stubbornly spend climbing while injured is going to exponentially increase the time it will take for you to heal. If you keep at it, it may also prevent you from ever fully healing, which could mean the eventual end of climbing for you. After about four weeks of rest, I no longer felt pain in my hand. I started climbing super easy stuff, as I read it in other articles it was a good idea to start climbing as soon as you could. I taped my finger and started working my way up from 5.5 and 5.6s to eventually juggy 5.9s. After a few climbing sessions, I re-injured myself and I was back to the same level of pain on day one. I later learned that the pain goes away when you are starting to heal. But you still need quite a while longer before you climb again, as the new tissues are still not strong enough. This takes us to #3. The physiotherapist I eventually went to see, told me that most people re-injure themselves after 4 weeks. The pain goes away and you think you are healed, so you go push yourself too hard, too fast. Minor tendon injuries, like mine, take at least 8 weeks to heal. If you re-injure yourself, you need to start the 8 week clock over again. If I hadn’t gone out and climbed a few weeks after my injury, I would probably be climbing right now on this beautiful sunny day instead of writing a blog post. I know they are expensive, but even if you can afford to go just once, go. If you can afford to go more than once, keep going. At first, I did a lot of reading and tried to self-assess how bad my injury was based on what different articles said. I read books to see what stretches I should do. I read that you needed to massage your finger to help reduce scar tissue. I watched videos about taping my finger. Looked at anatomy diagrams. I read certain things would hurt if I was doing them right, which I later found out not to be not true. This led me to do things that were not appropriate for my particular injury and slowed down my healing, as I pushed things way too fast. A physiotherapist can help you figure out what is appropriate for your particular situation. To find one, I posted on my climbing gym’s facebook group asking for recommendations. The woman I ended up seeing is actually a fellow climber and has been so helpful. If you refuse to go see someone, please at least go so slow with what you read online. Never do anything that causes pain. You can’t muscle your way through this. It is just going to take a while. Linda Walker at Brentwood Phsyiotherapy. She is a climber & an experienced PT. She helped me heal physically and with my anxiety over missing outdoor climbing season. I would not recommend going to see other people at that practice for hand issues. You may have to wait a week or two for an initial appointment with Linda. Their office is blocks away from Boulders, so you can feel sad/hopeful as you drive by. Island Hand Therapy: I went there for one visit for an unrelated & thankfully minor issue. I was very impressed with how much time they spent with me, the detailed exercises & handouts, and the focus on educating me about anatomy. 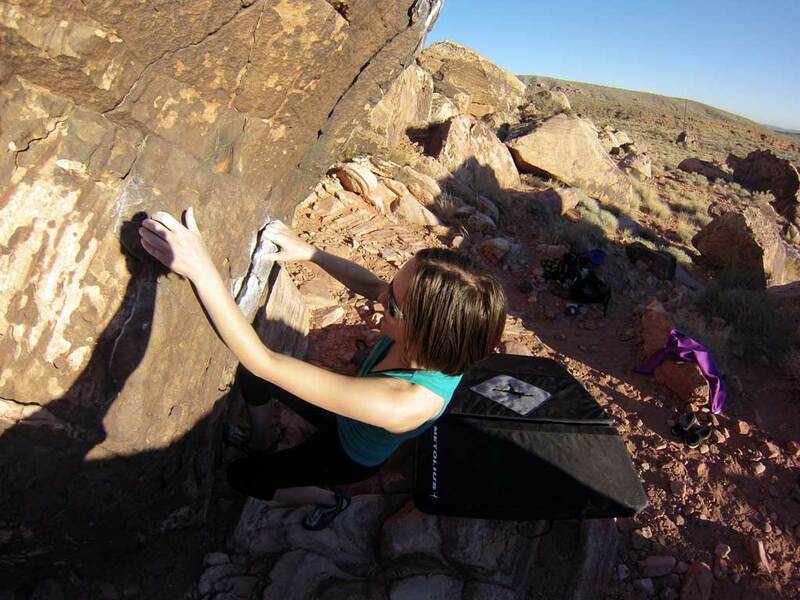 Feature image: A photo of me bouldering (pre-injury) in Nevada.